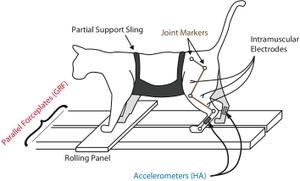 While I was at Johns Hopkins University during the summer, I found out about the first demonstration of a new chip that can be used to stimulate locomotion in an animal (tested on a temporarily-paralyzed cat, see right). Unlike previous controllers, this one is tiny and low-power. However, it can still take account of the sensory input coming from the movement of the limbs through a tiny neural network. I find the work very interesting and, potentially, extremely important. Rather than explain it here, I recommend you check out the story I wrote for EE Times on the subject. Let me know what you think. Figure: The schematic of the experiment showing locomotion stimulated by a central pattern generator (CPG) chip. For more details of the electronics, click on the picture. In my review of Kurzweil's The Singularity is Near, I said that I felt the author's ideas about nanotechnology were unconvincing. I'd like to elaborate on that now. I don't claim to have huge expertise in the field: I'm not a chemist. But I have been following it for almost 15 years: I remember hearing Drexler talk about his work when I was based at MIT in the early 1990s and have had an interest in the subject ever since then. I've been editing a publication on the subject for several years and even refreshed myself in this area last month, attending a study trip on the subject for journalists in Switzerland. There is a mismatch between nanotechnology as it is understood by Kurzweil, Drexler, and much of the public, and what it really is. The fantasy version (depicted by an artist, right) is that machines will be arbitrarily constructed molecule by molecule, and that tiny nanomachines will operate and make decisions independently. Despite Drexler's work, I suspect there will be energy and entropy problems with performing the former, and information problems with the latter. Without getting very technical, all of these come down to the same thing: the more precisely you need to control things, the more energy/entropy/information you require. Unlike an old editor of mine however, I'm not one of these people who dismisses nanotechnology: there's some truly fascinating stuff happening in the field. In particular, the development of metamaterials—nanostructured materials that have properties very different from the individual chemical compounds they are comprised of—has been extremely important. But these are made in a macroscopic way: chemicals self-organize en masse to produce the tiny structures. 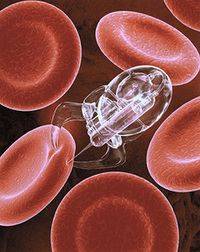 By the same token, the only nanobots that I have seen being seriously developed have been for applications like drug delivery. Again, these are built not one 'machine' at a time, but rather by chemistry. More importantly, they are also controlled the same way: en masse. Light, or some other field, or the injection/presence of another chemical is used to trigger the desired behavior (like releasing the drug). The 'robots' cannot make 'decisions' unless they are hardwired to by their chemistry and then pushed by local conditions, nor can they be addressed individually. This is no surprise: it's the way developmental biology works.